Please note that this current website does not have a shopping cart. 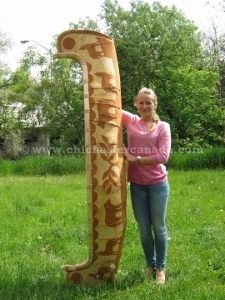 To buy our Attikamek Birchbark Canoes online, please go to our e-commerce website at NaturalExotics.ca. We occasionally get a small number of very nicely made birchbark canoes from the Attikamek in Manouane, Quebec. Manouane is a Native community about 150 miles northeast of Montreal at the end of a long logging road. The canoes are made in the traditional style using birch bark and spruce roots. The men usually make the canoes and the women etch the designs on the outside. These canoes are becoming more difficult to obtain with each passing year. The 12' to 14' full size canoes are available for around C$12,500 each. The designs are similar, just much larger. Genus and species: Betula papyrifera. Wild.